After years of only rumor and speculation regarding the next Batman movie, DC and Warner Bros. have hit fans with a slew of big official developments. In just a 48-hour span we've learned when Matt Reeves The Batman will hit theaters, what the film will loosely be about, the fact that it's getting a different official title, and (the biggest headline) the fact that Ben Affleck will be leaving the franchise, with Reeves tapping a new (and younger) actor to takeover the Batman role. Well, as fans drop their lists of suitable candidates to replace Ben Affleck as Batman, there's one (very unlikely) celebrity who's throwing his hat into the ring: pop-star Nick Jonas! As you can see above, the "CommentsbyCelebs" Instagram page pulled this exchange between Hypebeast and Nick Jonas over social media. 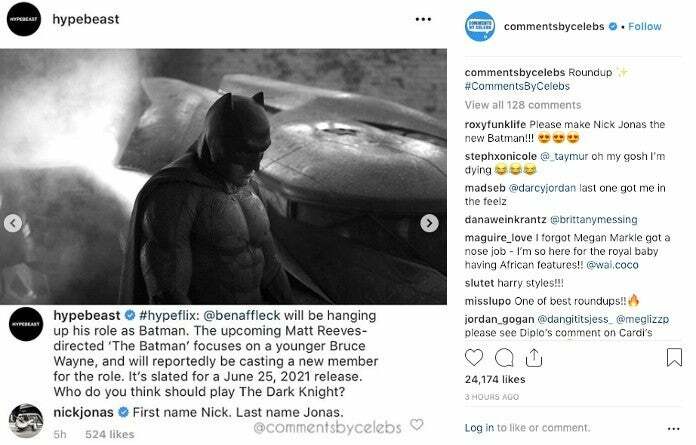 The Hypebeast account had posted a news alert stating, "@benaffleck will be hanging up his role as Batman. The upcoming Matt Reeves-directed 'The Batman' focuses on a younger Bruce Wayne, and will reportedly be casting a new member for the role. It's slated for a June 25, 2021 release. Who do you think should play The Dark Knight? That's when Jonas slid into the comments section with this little suggestion, in answer to Hypebeast's question: "First name Nick. Lat name Jonas."